Spotted while driving out to Perth this afternoon – they even remembered the ‘e’! I wanted to get a picture of that to show you when we were out that way a while ago, but couldn’t remember where it was to get my camera ready. 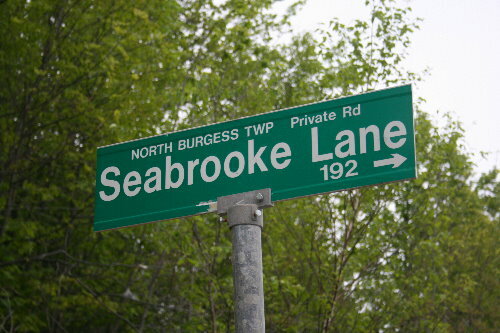 Unless we actually weren’t out that way and there is another Seabrooke Lane somewhere! Sweet. Can’t ask for more! Ooo, I know how you feel. Somewhere on the Bruce Peninsula is a crossroads signpost showing, in one direction, my last name, and in the other, E.g.’s last name! And yes, she got a photo of it. Beautiful pictures …keep up the excellent work.